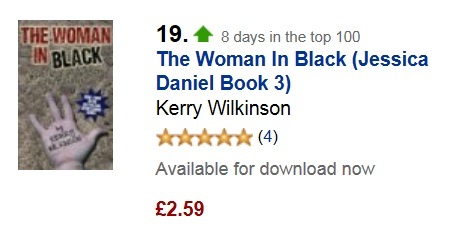 The third Jessica Daniel novel, The Woman In Black, was released barely a week ago but has now joined Locked In and Vigilante in Amazon UK’s overall top-20 books. I’ve had some really great emails and tweets about it. What perhaps makes it all the more remarkable is that there are also three “deal of the day” books in the top-20, which tends to skew the chart as the day’s particular offer always goes to number one. It’s all a tad overwhelming, so I’ll just say “thank you” for supporting the character. I will have some more news about future Jessica work in the next few weeks.